Bill Of The Month: No Warranty For Orthopedic Implant That Failed : Shots - Health News If implanted medical devices fail, patients and their insurers usually have to pay for repairs. That financial responsibility falls to them even when the problems were solely with the devices. Sarah Witter fractured two bones in her lower left leg while skiing in Vermont last February. She had two operations to repair the damage. 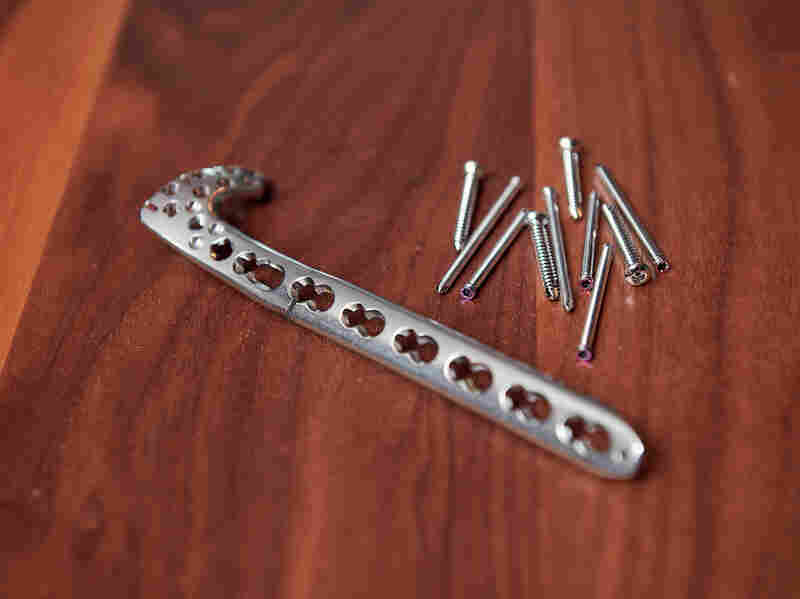 The second surgery was needed to replace a metal plate that broke after it was implanted. Sarah Witter couldn't catch a break even though her leg had gotten several. 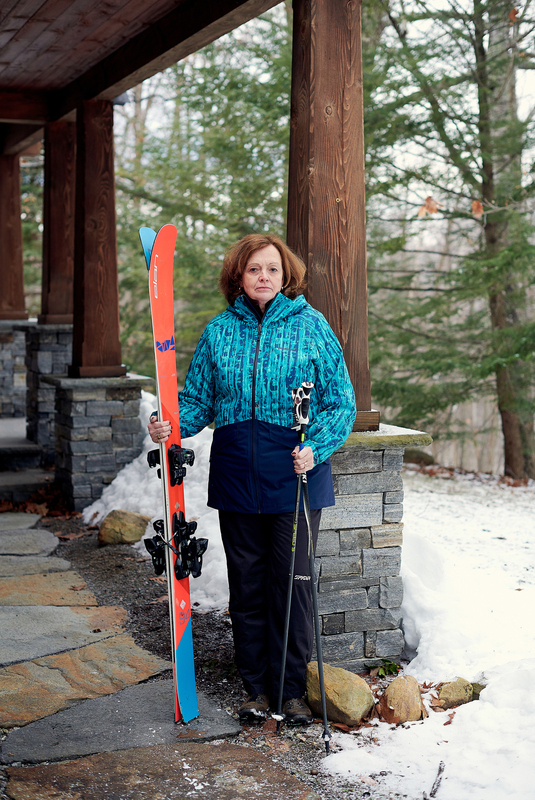 As she lay on a ski trail in Vermont last February, Witter, now 63, knew she hadn't suffered a regular fall because she couldn't get up. An X-ray showed she had fractured two bones in her lower left leg. A surgeon at Rutland Regional Medical Center screwed two gleaming metal plates onto the bones to stabilize them. "I was very pleased with how things came together," the doctor wrote in his operation notes. But as spring ended, the wound started to hurt more. In June, Witter returned to the doctor. "He X-rayed it and said it broke," she said. "And I was thinking, what broke? And he said, the plate. He said they do sometimes." "I was, of course, thinking, 'What did I do?' " Witter said. "The doctor said right off the bat it was nothing I did." Total bill: $99,159 for emergency services, therapy and hospital care, including $52,587 for the first surgery and $43,208 for the second surgery. Altogether, Witter's insurer, Aetna, paid $76,783. Witter paid $18,442 — including $7,808 for the second surgery. About half of Witter's total expenses were copayments; an additional $7,410 was the portion of hospital charges that Aetna considered unreasonably high and refused to pay. Service provider: Rutland Regional Medical Center, the largest community hospital in Vermont, performed the surgeries. Emergency services, anesthesia and physical therapy were done by other providers. Medical service: In February, two metal plates called bone fixation devices and manufactured by Johnson & Johnson's DePuy Synthes division were surgically attached to two lower leg bones Witter had fractured in a skiing accident. These plates are long, narrow pieces of metal with holes drilled in them at regular intervals for screws to attach them to the bones. A crack had developed in one of the plates running from the side of one of those holes to the edge of the plate. A second surgery was required to remove the plate and replace it. What gives: When devices or treatments fail and need to be replaced or redone, patients and their insurers are typically expected to foot the bill. That may be understandable if a first course of antibiotics doesn't clear bronchitis, requiring a second drug. But it is more problematic — and far more expensive — when a piece of surgical hardware fails, whether it's a pacemaker, a hip that dislocates in the days after surgery or a fractured metal plate. Warranties, standard features at an electronic store or a car dealership, are uncommon for surgeries and medical devices used in them. Dr. James Rickert, an orthopedic surgeon in Indiana and president of the Society for Patient Centered Orthopedics, said a plate like the one implanted in Witter's leg can fail if the surgeon doesn't line it up correctly with the bone, although usually that causes the screws to break or back out. A plate also can fail if the patient puts too much weight on it or doesn't follow other recovery instructions. There can also be a flaw in the implant. If implanted medical devices fail, as one of Witter's metal plates did, patients and their insurers usually have to pay for repairs. "I hate to pay for it again, and the doctor clearly said it wasn't anything I did," she said. "When the plate breaks, it's usually from overworking it, or a defect in the plate itself," Rickert said. "The vast majority of people follow their instructions and are honest about it. If a person comes in and tells you they've been following their instructions and the surgery's done properly, to me that's a hardware failure." Nancy Foster, vice president for quality and patient safety policy at the American Hospital Association, said sometimes hospitals won't charge for a second surgery "if they were aware that it was something they did that caused the patient to need follow-up care." Rutland Regional, Witter's hospital, wouldn't discuss Witter's care or bills, even though she gave it permission to do so. "The organization is not comfortable in getting into the specifics of an individual patient's case," a spokeswoman wrote. The hospital also declined to discuss under what circumstances, if any, it would discount a second surgery's cost because of the first's failure. Hospitals don't consider it their responsibility if a medical device failure is the problem, Foster said. But manufacturers are reluctant to take the blame for an unsuccessful surgery. AdvaMed, a trade group for medical device manufacturers, said some companies will provide replacement devices if theirs failed, but others don't, especially if the failure of a procedure cannot "easily be attributed" to the device, the group said in a written statement. "There are numerous factors outside of a manufacturer's control — and unrelated to the safety of the device as designed — that could result in a device not performing as intended," AdvaMed said. These devices aren't cheap: Witter's hospital billed $9,706 for the first set of plates. It billed $12,860 for the replacement and an extra piece of equipment to attach it. DePuy Synthes, which manufactured Witter's plates, said in a written response that "in rare circumstances" metal plates "may fracture under normal weight-bearing or load-bearing in the absence of complete bone healing." Even then, the company said, that is a chance patients have to take. AdvaMed said it doesn't keep statistics on device performance, and DePuy didn't respond to questions about how often its plates fail. Resolution: The second surgery delayed Witter's recovery by four months and prevented her from gardening, golfing, hiking, biking and motorcycling through the summer and fall, as she usually does. "I was pretty much chairbound for 20 weeks," she said. In November, she wasn't able to join her husband and son on a trip to Iceland. 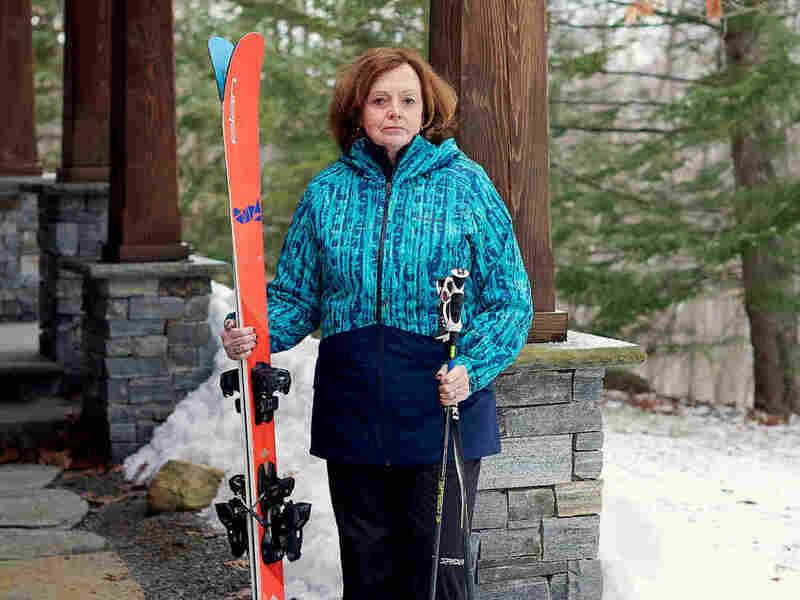 Instead of volunteering at a nearby ski resort, as she had done for six years — and which carries the benefit of a free season pass — Witter said she tried selling hand warmers and lip balm out of a small kiosk and watching the skiers through a window. She said she had to quit after six days because of the pain in her feet. "The biggest annoyance with this whole thing, even though it took eight months out of my life, is I hate to pay for it again, and the doctor clearly said it wasn't anything I did," she said. After reviewing Witter's records, Aetna said it concluded the hospital had billed Witter for the portion of charges Aetna had considered excessive — a practice known as "balance billing." While Aetna cannot reject those charges because the hospital doesn't have a contract with it, the spokesman said Aetna would try to negotiate with the hospital on Witter's behalf to reduce the bill. Rutland Regional, however, indicated in its statement that the only reason it would discount a bill was for people who had inadequate insurance or were suffering financial hardship from the size of the bills. Witter said she doesn't meet the hospital's criteria. The hospital invited her to meet with her surgeon and its chief financial officer. The takeaway: Witter brought up the seeming unfairness of the double charges to the hospital's billing department as well as to her doctor, who, she said, was "charming," but told her "he had no wiggle room to do anything." Patients are usually out of luck when a second surgery is needed because of the failure of a medical device or a surgeon's mistake. A few places, most prominently the Geisinger health system in Pennsylvania, offer warranties for hip and knee, spine and coronary artery bypass surgeries, among other procedures. AdvaMed says that if a company provides a replacement, the hospital or surgeon isn't supposed to bill Medicare or the patient for the equipment — even if the operation incurs charges. Patients should scrutinize their bills and question their doctor and hospital or surgical center about charges for replacement devices. If the doctor or hospital is partially at fault for the failure of the first procedure, request that part or all of the costs of the second surgery be waived. Get it in writing so you can make sure the billing department follows through. Also, in a medical market where insurers want to pay only for value-based care, let your insurer or employer's human resources department know that you are being charged twice for the same surgery. Let them fight the battle for you. NPR produced and edited the interview with Kaiser Health News' Elisabeth Rosenthal for broadcast. Nina Keck, a reporter with member station WVPR in Vermont, provided audio reporting. Do you have an exorbitant or baffling medical bill that you'd like KHN and NPR to look into? You can tell us about it and submit a copy of the bill here. KHN is a nonprofit news service covering health issues. It is an editorially independent program of the Kaiser Family Foundation that isn't affiliated with Kaiser Permanente.